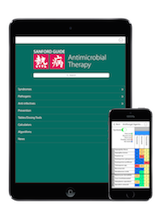 The Sanford Guide to HIV/AIDS Therapy mobile app provides detailed information on the diagnosis and management of HIV/AIDS and related syndromes. 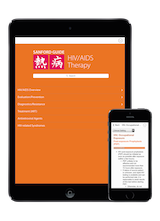 The app expands on the print edition of the Sanford Guide to HIV/AIDS Therapy, and reflects the current state of HIV medicine, including once-daily combination drugs for treatment of HIV-1 and revised protocols for the diagnosis and testing for HIV-1 and HIV-2. 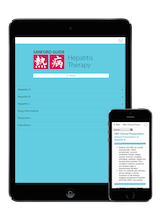 Organized by topic or navigable using our full-text search, the HIV/AIDS Therapy app includes comprehensive, concise, and reliable information for the practicing clinician. Each one-year subscription includes ongoing content updates, ensuring that you will always be referencing the most current information available. Subscriptions purchased here at the Sanford Guide Online Store may be used on both iOS an Android mobile devices, while subscriptions purchased from the Apple App Store or Google Play will only work on the platform associated with that store. Apps are optimized for Android 6.0 and above, and iOS 9.0 and above.